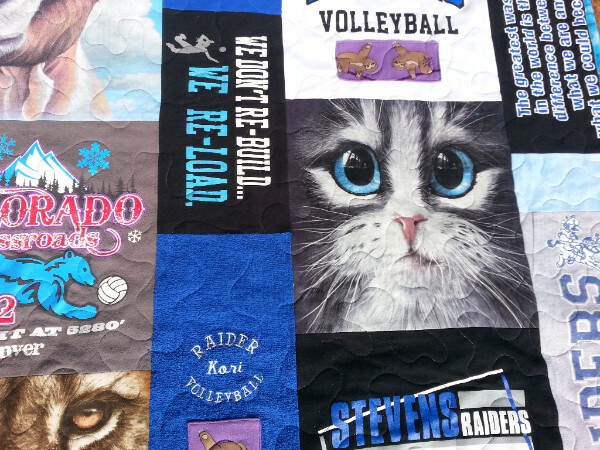 Graduation Quilts are in full swing here at MQBM! Sadly, I can't share many pictures of them this month. I wouldn't want to spoil the surprise! Since I am approaching my 5th anniversary of being in business, I have noticed a few trends that I will share in this newsletter. 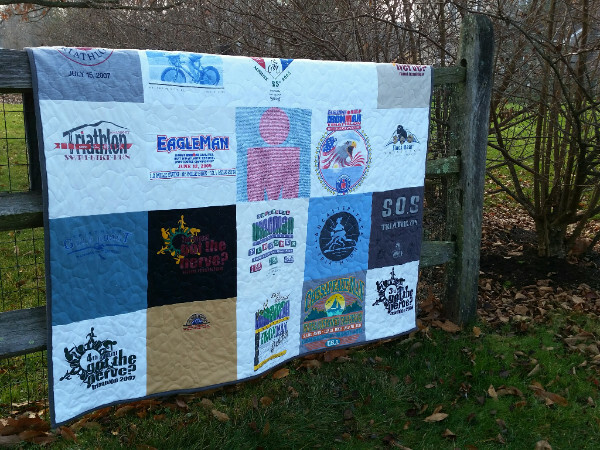 Contact me if you or someone you love needs a Memory Quilt. Currently, I have 26 quilts on my schedule. 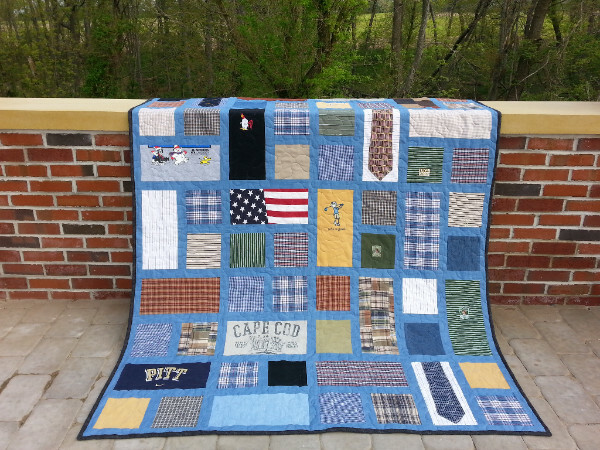 Sadly, I can no longer guarantee June delivery for graduation quilts, but they can be made for August delivery, just in time for that special graduate to go to college or begin work! Below is what's trending here at MQBM! Enjoy! This style works well if you do not have many t-shirts but have other shirts like cotton button down shirts, flannel shirts, or golf shirts. The Modern Lap quilt is, by far, the most popular quilt that I make! 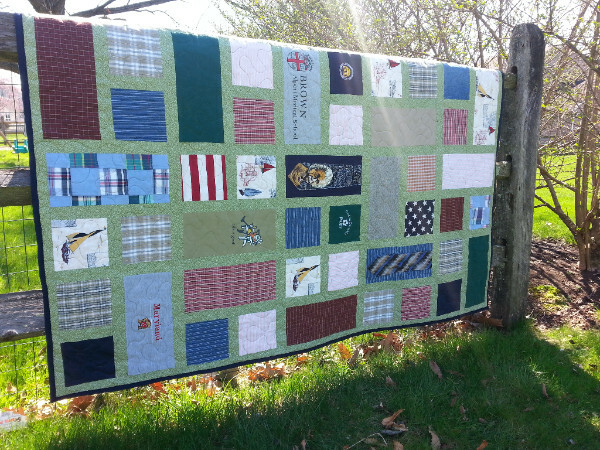 At 68" wide by 73" long it is a wonderful size! 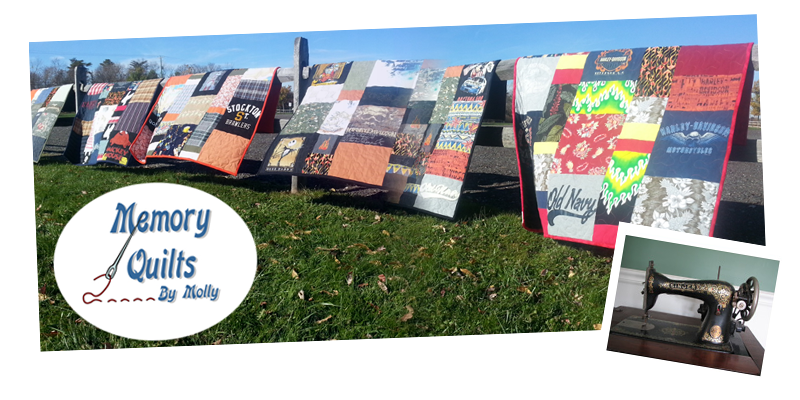 Plenty of quilt to wrap yourself in and easy to take with you no matter where you go! 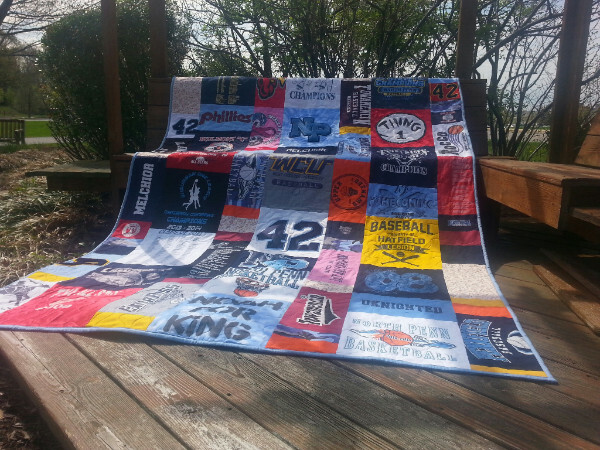 20-25 t-shirts are needed for lap quilt, 60 shirts for King size. 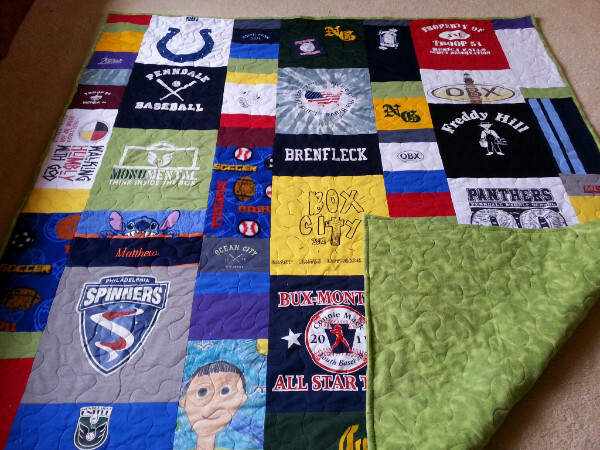 The extra long twin size quilt (in any style) measures 70" wide by 95" long. It is plenty big enough to fit on the extra long twin size mattresses in college dorms. 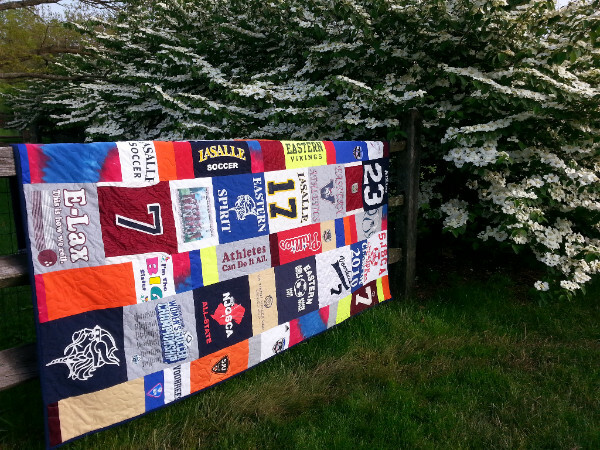 Roughly half of all of the graduation quilts that have been made this year have been this size! Many families have 30 or more shirts for this size. 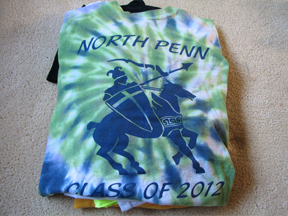 Moms realize that the shirts probably won't be worn again once the child goes to college. Making a twin size quilt is a perfect way to re-purpose them! This size makes a truly special graduation gift. 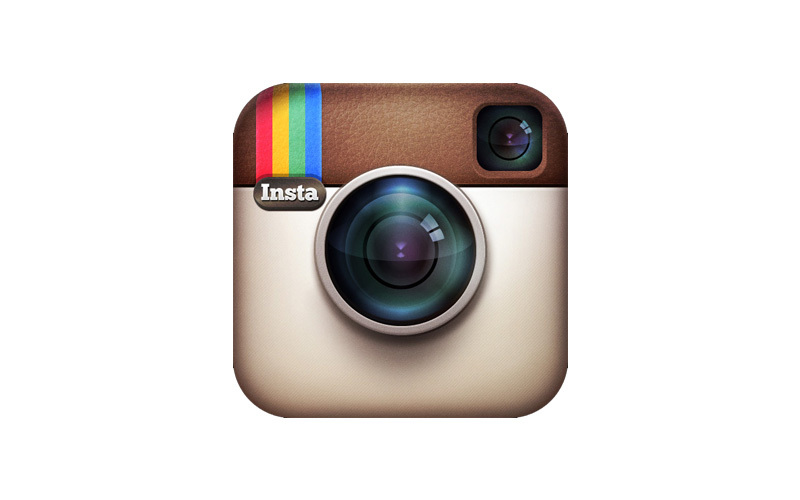 It is practical because a comforter for the college dorm bed is no longer needed. 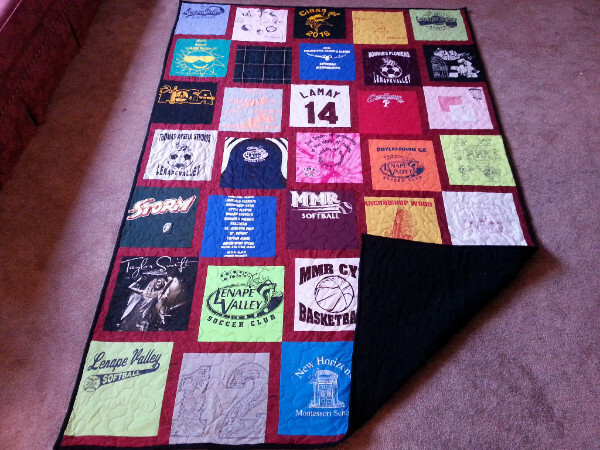 Shown above is a Staggered style twin size quilt. 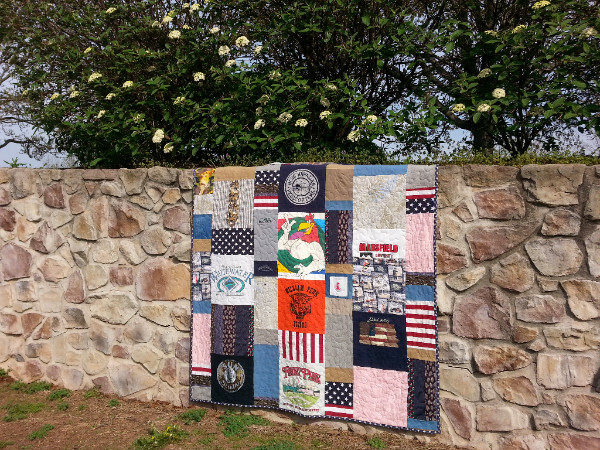 Look closely and you will see a block made from the child's school uniform!